In previous posts we have discussed the benefits of dynamic stretching in order to help prevent injury. Dynamic stretching exercises are best performed as part of your warm up routine and involve using movement or momentum to move a muscle between its extremes of range. Justin Merlino, Sports & Musculoskeletal Physiotherapist here at Stadium Sports Physio, has put together the following list of exercises that can be incorporated into any warm up routine. When completing these exercises remember that movements should be controlled and should not be vigorous or bouncy at the end of range. Begin with feet shoulder width apart, then step forward with one leg, flexing the knees to drop your hips. Descend until your rear knee nearly touches the ground. Drive through the heel of your lead foot and extend both knees to raise yourself back up. Begin with feet shoulder width apart, then step forward with one leg, landing on the heel of your foot and then rising up onto your toes. Lower yourself down in a controlled way and then repeat on the opposite leg. 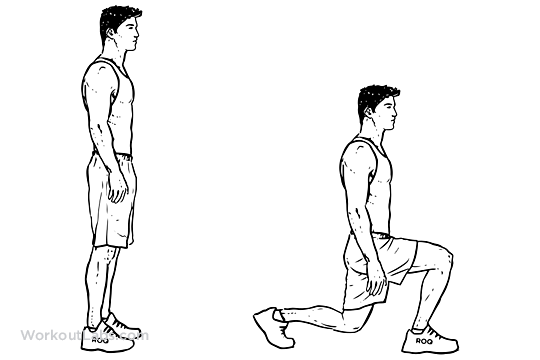 Begin in a semi squat position with your feet hip width apart and hands on hips. Slowly step sideways, maintaining the squat position and ensuring your pelvis and shoulders stay level. Repeat for 10 meters in both directions. Begin in a prone position on the floor, supporting your weight with your hands and feet. Your arms should be bent to 90 degrees. 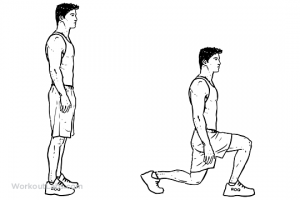 Initiate the movement by raising one foot off the ground and externally rotating the leg, while bringing it as close to the elbow as possible. Begin in a push-up position on the ground. Slowly step your feet in towards your hands, keeping your knees straight. Step as far as you can that’s comfortable for your back and hamstrings, then slowly walk your hands forward to the starting position. Begin lying on your back with your knees bent up and feet flat on the floor. 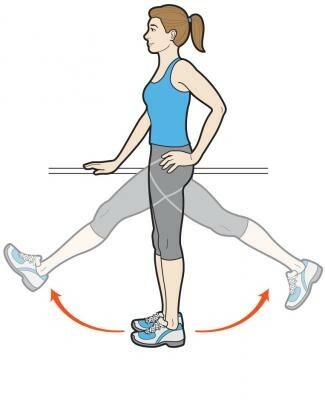 Push through your heels and slowly lift your hips off the ground until they are in line with your knees and shoulders. Slowly lower yourself back to the starting position. This can also be performed on one leg with the other leg held in the air. Begin sta nding on one leg with your arms out to the side or in front of you. Slowly tip forwards from your hips, keeping your back flat and with a very slight bend in your stance knee. Tip forwards until your trunk is nearly parallel with the ground, making sure you don’t twist with you pelvis. Squeeze your buttock and then slowly extend back up to the starting position. Brace your core then gently swing one leg forwards as far as you comfortably can and then allow it to swing backwards just past the midline of your body. Begin facing and holding onto a sturdy object. Swing one leg out to the side as far as you comfortably can, then swing it back across your body as far as you comfortably can. Begin by slowly jogging forwards, then increase the height of your knee lift with each step until your thighs are just above parallel to the ground. Maintain an upright trunk position and try to land on the balls of your feet with each step. Make sure to drive the opposite arm forwards to the knee that is moving up in the air. Begin by slowly jogging forwards, the try to kick your heel up towards your bittock with each step. 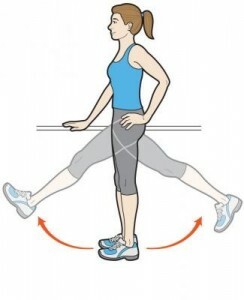 Perform a criss-cross with your legs by stepping side-to-side. Make sure to keep your trunk and pelvis perpendicular to the direction you are running. ⇐ Dynamic or Static Stretching? Which is best?